Posted by Sebastian Gross on Februar 26th, 2015 . Open Auth is everywhere, maybe you even read my article on how to retrieve calendar events from your google calendar using open auth. 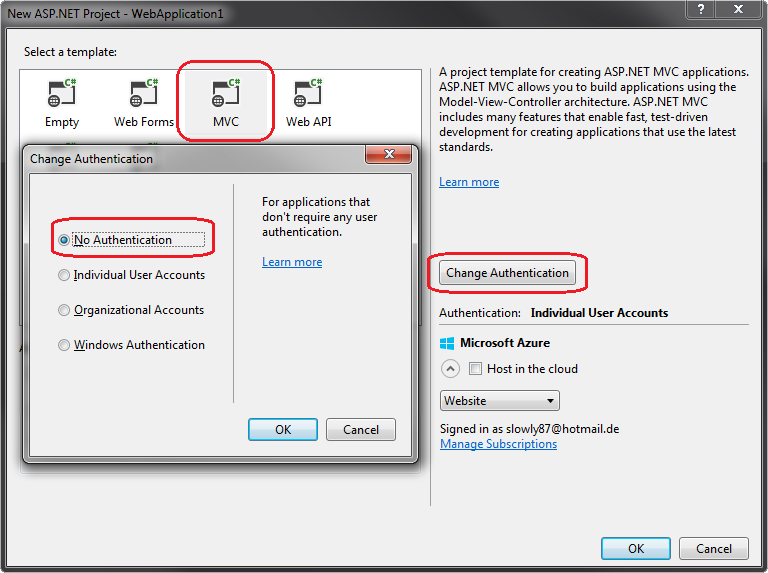 In this article i would like to show you a simple way to create an open auth login for your asp.net mvc website. Basically you can just open up visual studio and create a new asp.net mvc project and select individual user as the authentication template. Visual studio will now create a new project template for you with working examples for Google, Facebook and Microsoft open auth login. But as you’ll quickly notice this is a very complex example which is only good for authentication, so if you want to have different information about the user (i.e. his picture) or want to perform actions in his name (post to the wall in facebook) you’re out of luck. This is where this article comes into play. We will create an authentification mechanism which will allow us to have additional rights next to simple authentication while keeping the codebase small and clean. Before you can start writing code you first need to create public and private keys to authenticate your application to google. I covered this topic at my last article, so if you dont have your tokens yet, just follow the link and read through the chapter „API Setup“. Afterwards continue here. So lets have a look on the order of events which will take place in our application. Our application gets called and checks if the authentication cookie is set. Since its the first call to our application the cookie is not present. The application redirects the user to the login page. The login page offers the user to login using open auth with google as the provider. The user clicks on the link to login via google. Open up Visual Studio and create a new Asp.Net MVC (5) project, be sure to select an empty project template without athentication to make sure we start with a clean codebase. Of course you need some kind of database to store your registered users. I won’t cover the topic of setting up a database in this article but i would recommend you to use EntityFramework in order to create a simple database very quickly without a lot of configuration. Just that you know, we don’t actually need the Plus.v1 package for successful authentication, but since i would like to know the users name, profile picture and other basic information i added this dependency too. Without this package we (as the application) would only get to know the google account id, which is the E-Mail Address by default. if this is enough for you just don’t add the last package to your project. Nothing special here, just some properties to hold the basic user information including some validation tags to make MVC do the dirty work. The important part is happening in the first lines of this Action-Method. We create a new AuthorizationCodeMvcApp and provide an new instance of GoogleAuth to it. The GoogleAuth Class extends the FlowMetadata Class provided by the Google API and overrides Flow property which provides the client secret and the needed app privileges to the API. And thats basically it. Since the API is doing most of the heavy lifting of redirecting and receiving the callback we’re finished here. Just add a Db-Provider (i.e. EntityFramework) and some Views alongside with some Account-managing-Controller and you’re ready to go. You can find a working web application using this example in my github repo.